Choose the PortaLift mobile jim arm crane if you are looking for a truly flexible, motorised crane. This mobile jib crane has a wide range of modules to choose from, for example: adjustable columns, boom arms of different lengths and a long list of standard tools and lifting equipment. For safe handling, our jib cranes and tools are equipped with safety systems, adapted for the load that is to be handled. If you can’t find the tool you are looking for among our standard tools, we can of course produce a customised one to meet your specific needs. If you want a mobile jib crane, you can simply mount it on a floorplate. 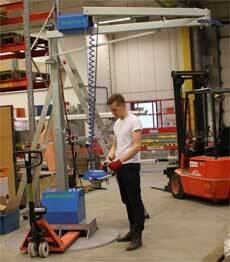 The crane with floorplate can easily be moved around with a standard pallet truck or forklift. 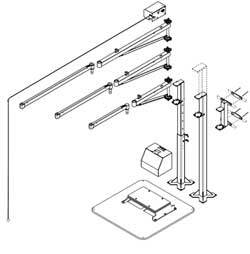 These mobile cranes can be installed in various ways, directly on the floor, to the wall or on an existing column. The PortaLift portable crane requires very little maintenance. Max load 85 kg and a reach of 2-4 meters. Our self-manufactured articulated jib crane, designed for handling goods up to 85 kg. The crane is built using a selection of different modules which makes it very easy to put together a crane that is perfectly tailored to suit your needs. Choose as you prefer between mains or battery. No installation procedures required. The PortaLift can be fitted with a range of hoists, mechanical and magnetic tools, as well as with pneumatic and vacuum lifting equipment. The mechanical operating handle is adjustable to become ergonomically optimal for each user and it is suitable for both right-handed and left-handed persons. PortaLift and PortaArm – a great improvement to your working environment. Lifting becomes a great deal easier, while subjecting back and body to less strain and reducing the risk of repetitive strain injuries and the rate of sick leave. Economically you’ll gain by thinking ergonomically. The economics of ergonomics makes sense. Our modular design enables you to put together a crane perfectly adjusted to your needs. The cranes can be installed in various ways, either directly in the floor, on the wall or on an existing pillar. If you require your crane to be mobile it can be mounted on a floor plate. Like this it can easily be moved around your premises with the help of a manual pallet truck or a forklift. Choose between mains or battery, no installation required. VMS – (Vacuum Monitoring System). VMS is an integrated security system that monitors the vacuum level to ensure safe lifting. Lifting can only take place if the vacuum level is sufficient. AVSG – (Accidental Vacuum Shut-off Guard). AVSG prevents the vacuum from unintentionally being turned off during ongoing lifting. 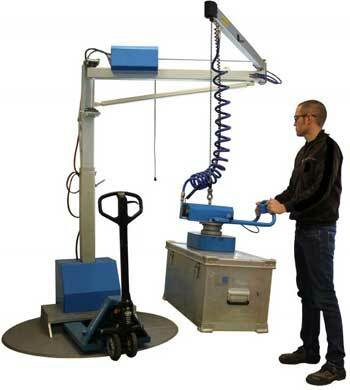 PortaArm is our jib crane, designed for handling goods up to 85 kg. The crane construction is based on different modules, making it very easy to put together a customer-designed crane that suits your needs. 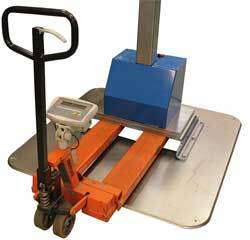 Mounted on a floor plate PortaArm can easily be moved around in your premises. With the help of a pallet truck or forklift the crane can without trouble be moved between different sites of operation, making it the ideal solution at a temporary workstation. The adjustable column can simply be adjusted to desired height. This grants greater flexibility in your production. With the column set to it’s lowest position it’s easier to move the crane around. Since the boom is articulated at the centre, working with the slewing arm is very easy. It allows loading and unloading of goods in the entire working range. The arms are available in different lengths. It’s easy to adjust the arms to compensate for sloping floors. The lifting function is operated by an electric motor which is equipped with an adjustable speed control to regulate the lifting speed. The motor is mounted on the folding arm, which increases flexibility and makes it possible to mount the slewing arm on an existing pillar or directly on the wall. PortaArm can be connected to a standard outlet, 220V. Maintenance-free, rechargeable batteries are also available. The battery pack is mounted in the blue box on the floor plate.